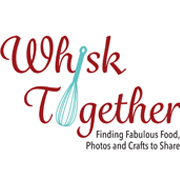 I haven’t posted a craft for a while and with the hectic week I haven’t been able to try as many recipes as I would like. 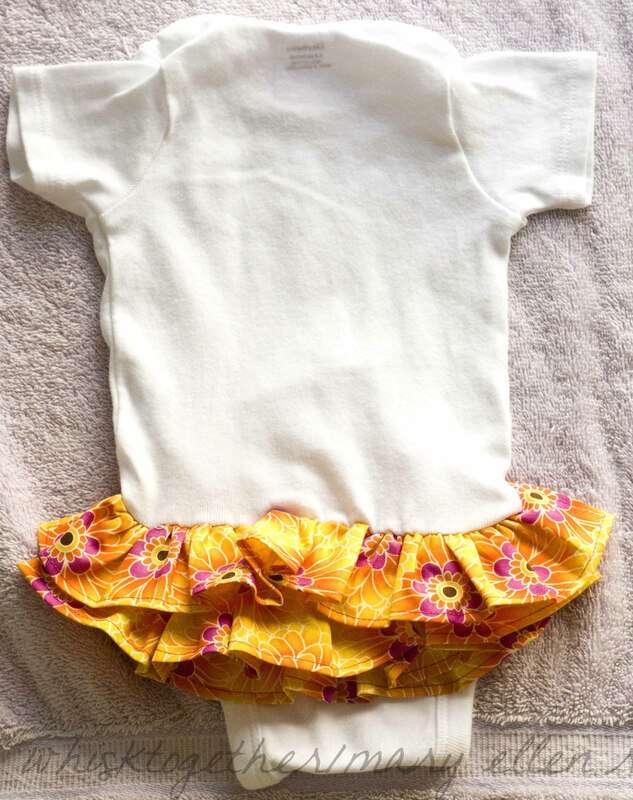 Instead, I’d like to post this easy sewing craft which I like to use often for baby showers, gifts, etc. For the onesies, I usually buy them in 3-9 month sizes. After having a 10 lb. baby, I have this thing about buying newborn size stuff. 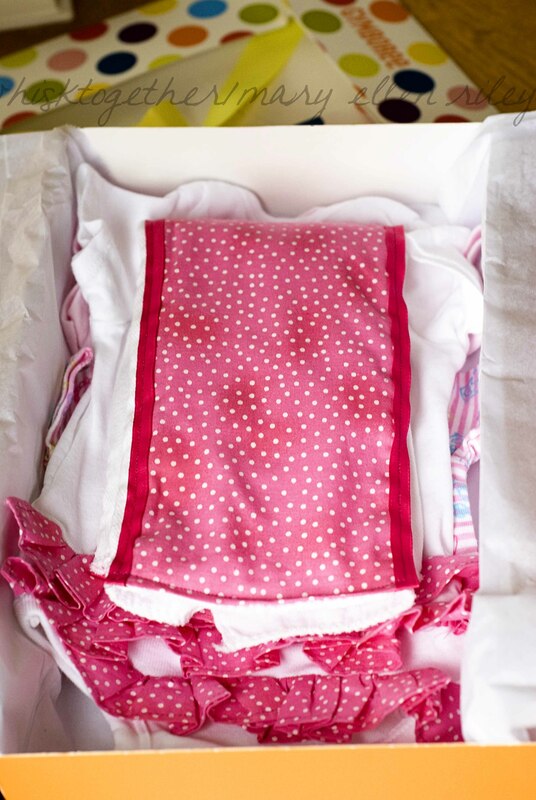 You can find the burp cloths/ cloth diapers in the baby section and many moms would recommend the 6 ply since it is much thicker. I like how you can make the burp cloths coordinate with the onesie, or you could even coordinate them with this awesome inside out tote bag! Apologies for some of the lighting in the photographs. 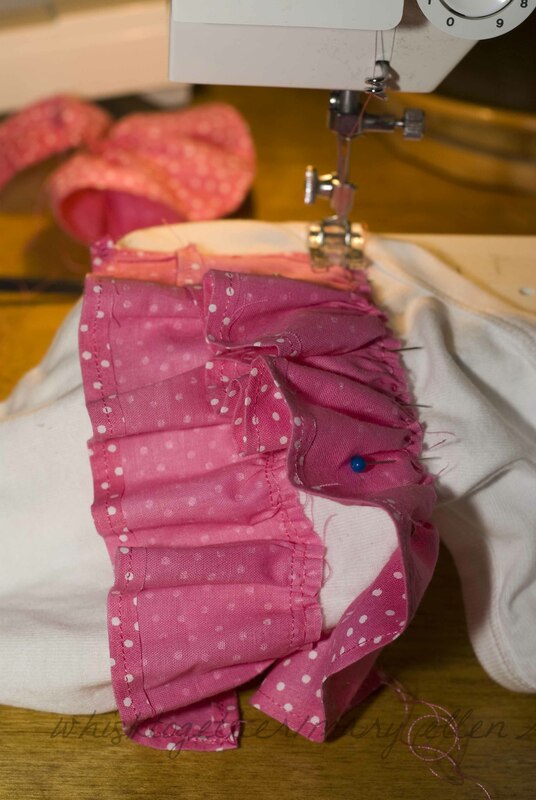 The only time I am able to sew most days is after the kids go to bed at 8pm. 1. Flip your onesie so that the back is facing you. Measure from the top of the curve of the leg opening straight across to the other top of the curve. You can draw a line using a washable pencil/disappearing ink pen or I use pins. 2. Now measure 1″ above that line and draw another line straight across. Measure 1″ below the bottom line (This one was about 6″ for me) and draw/pin straight across. 3. 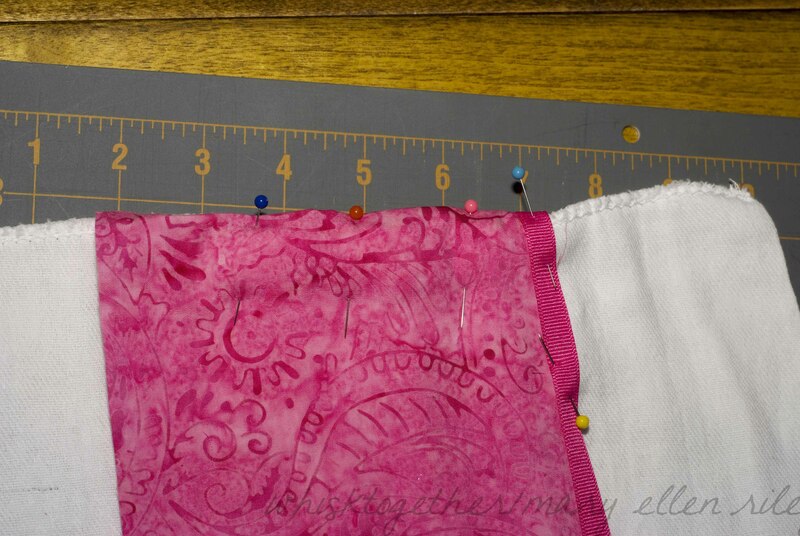 Depending on if you want to serge the ends will determine the width of the cut of fabric. Or, you are a loser like me and just don’t have a serger. Woo hoo! If serging, cut the same length, but make your width 2″. Cutting with pinking shears would be handy. 5. 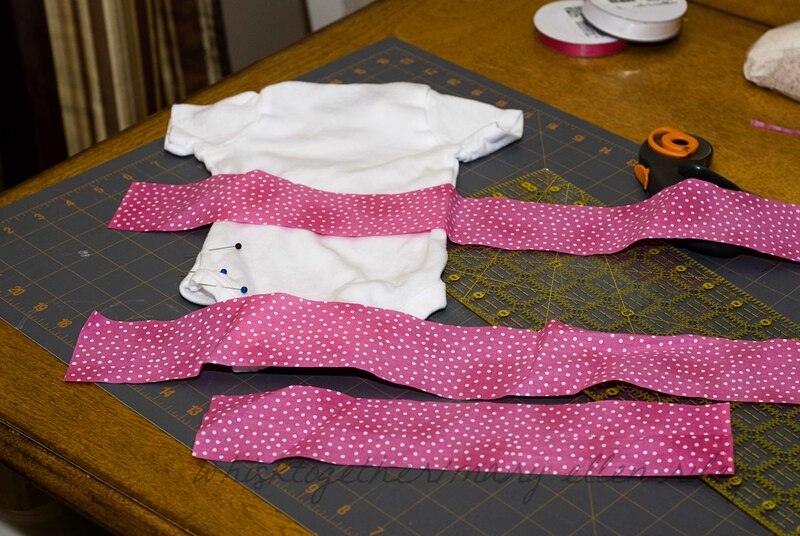 If not serging, fold over and sew 1/4″ on both short sides and one long side of each strip. If serging, simply serge around all 4 edges. 6. Now, on the long side that was not sewed 1/4″ (or any long side for the serged one) – sew a gathering stitch less than 1/4″ from the edge. 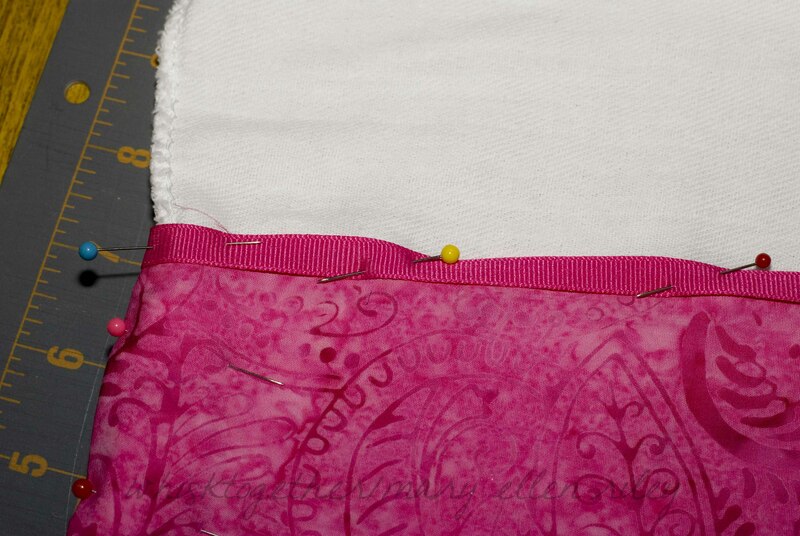 Here, I move my needle to the right and sew on the 1/4″ line. That way my gathering stitch is just slightly inside the permanent stitch. 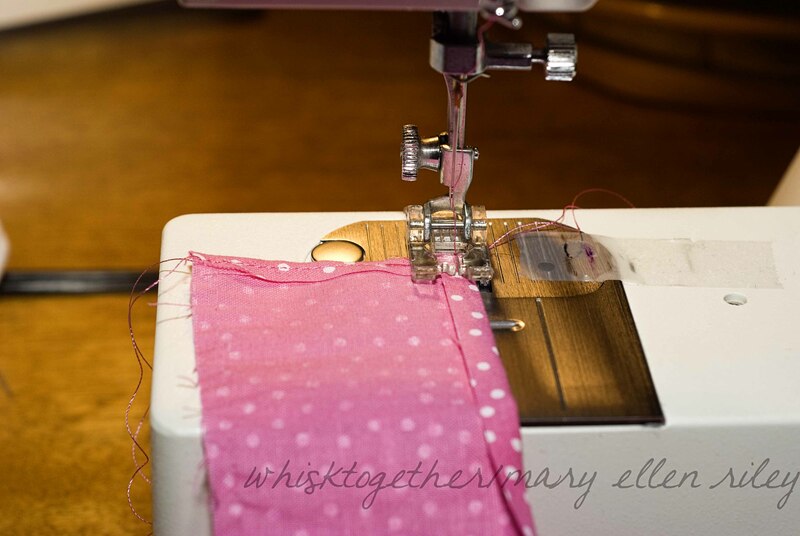 To sew a gathering stitch, simply select your sewing machine to sew it’s longest stitch (mine is a 5) and make sure to leave lots of thread on both ends. 7. 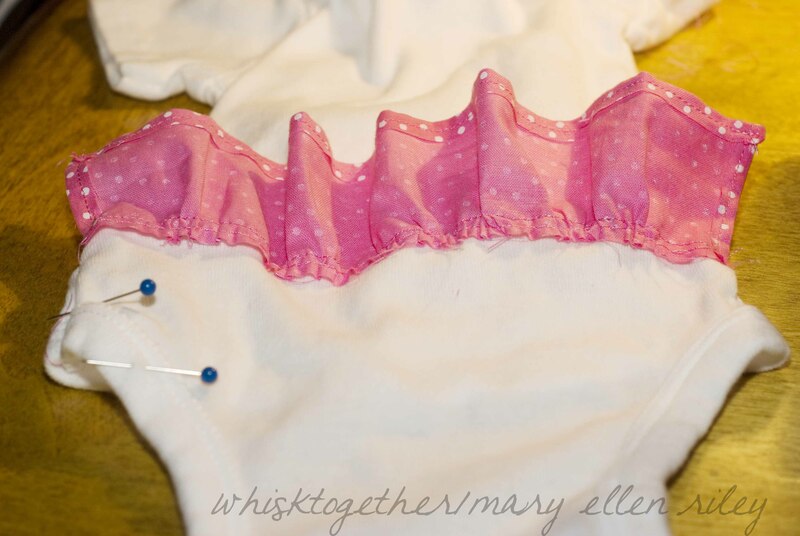 Gather the ruffle and use the onesie as a guide as to how tight to make the ruffles. 8. 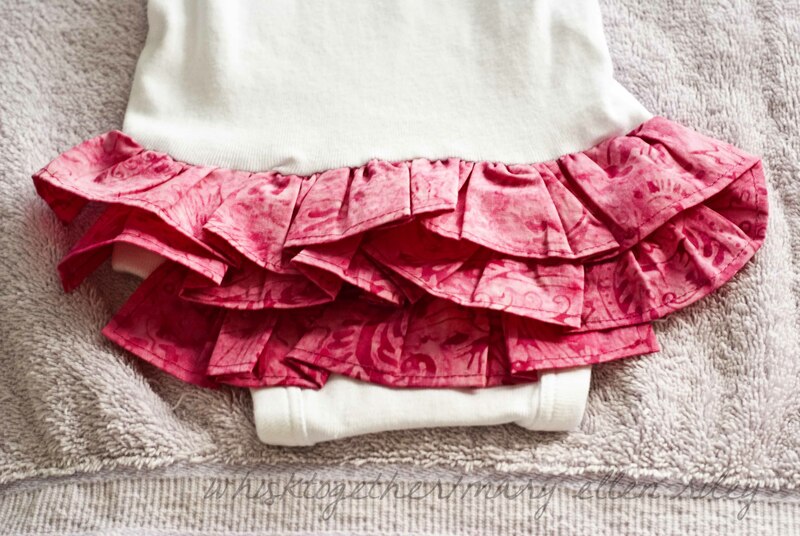 Pin the ruffle to the onesie. I start at the top and work my way down. Sew 1/4″ stitch (remember to change your stitch size back to normal!!). Do this for all 3 ruffles. 9. Iron the ruffles down like crazy. I haven’t done this, but others have. 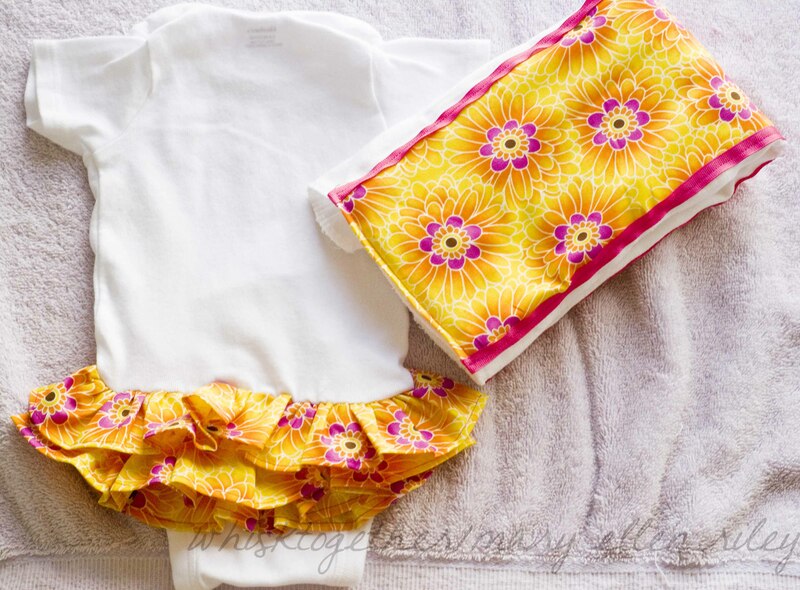 Instead of sewing one edge down and flipping it, gather and sew the ruffle right down the middle. 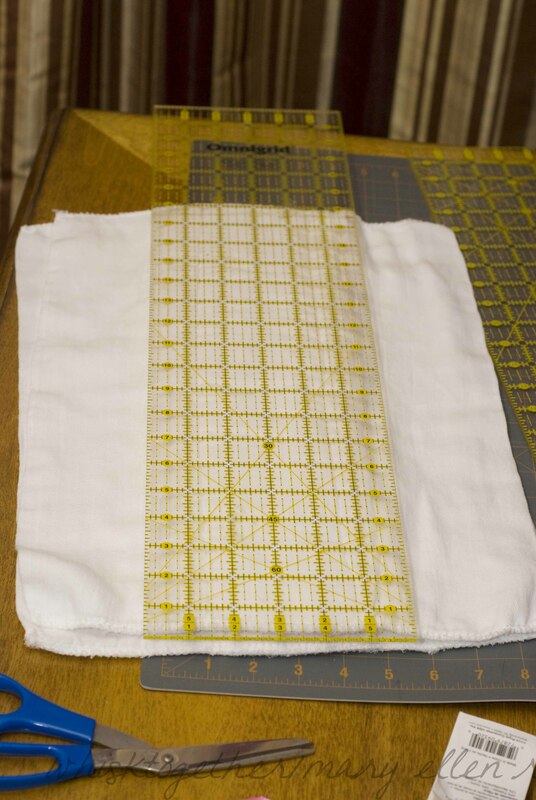 This would work best I think with a serger, so I haven’t done it. 1. This project is much faster than the onesie. 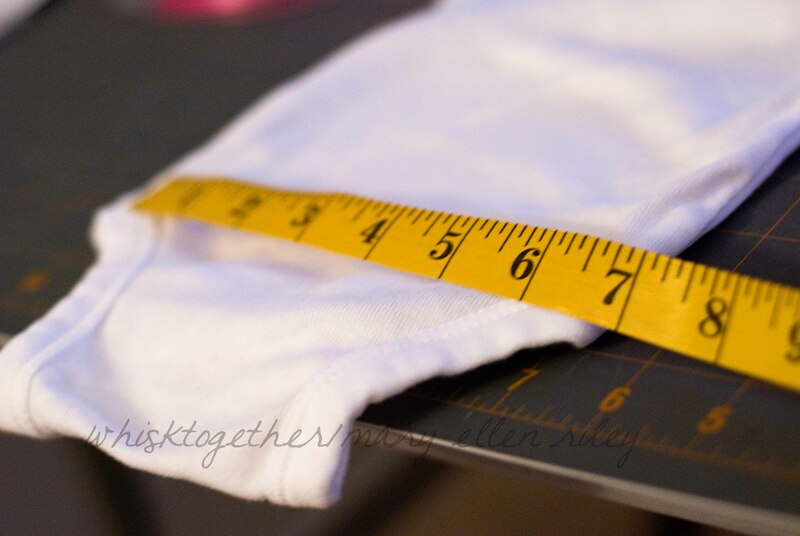 Measure the rectangle in the middle of the cloth and cut a piece of fabric that is 1/2″ larger than that size. 2. 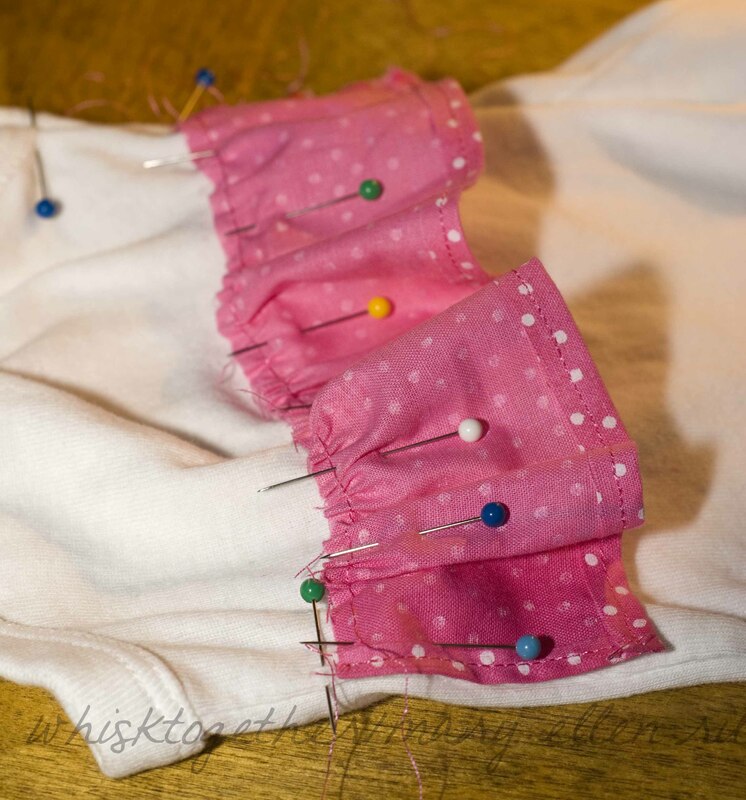 Pin your fabric down to the cloth while folding it under along the edges 1/4″. 3. 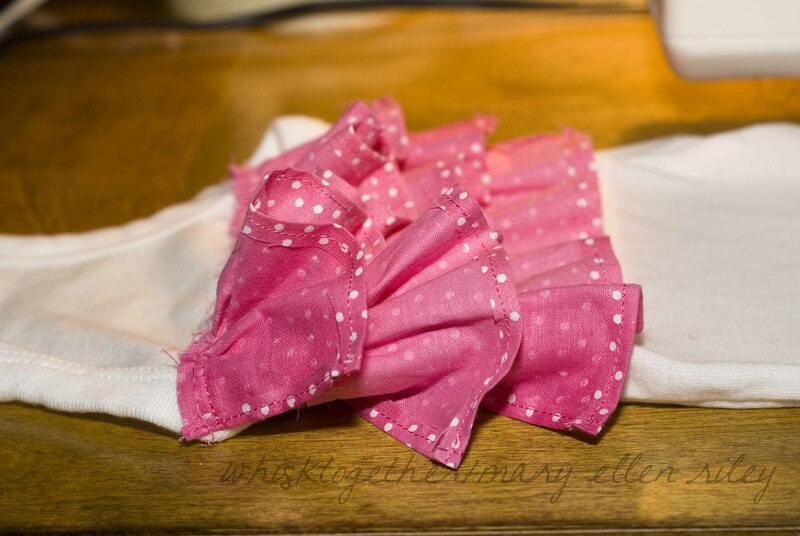 Measure the length of the cloth and cut two pieces of ribbon that are 1/2″ longer than the cloth. Pin the ribbon along the long edges of the fabric. Sew all the way around paying special attention to the long edges. Make sure you are sewing through all of the fabric and ribbon.